Accounting is the language of business, increasingly standardized across the world through powerful global corporations: a technical skill used to reach the correct, unquestionable answer. Yet, as recent corporate scandals have shown, a whole range of financial professionals (auditors, bankers, analysts, company directors) can collectively fail to question dubious actions. How can this be possible? To understand such failures, this book explores how accountants construct the technical knowledge they deem relevant to decision-making. In doing so, it not only offers a new way to understand deviance and scandals, but also suggests a reappraisal of accounting knowledge which has important implications for everyday commercial life. The book is based on interviews with chartered accountants working in the largest accountancy practices in London. The interviews reveal that although accounting decisions seem clear after they have been made, the process of making them is contested and opaque. Yet accountants nonetheless tend to describe their work as if it were straightforward and technical. Accountants' Truth digs beneath the surface to explore how accountants actually construct knowledge, and draws out the implications of that process with respect to issues such as professionalism, performance, transparency, and ethics. 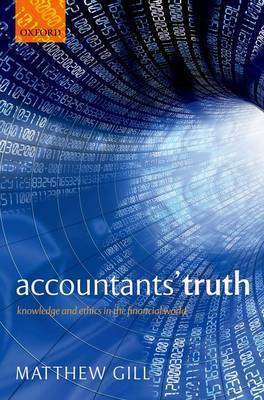 This important book concludes that accountants' technical discourse undermines their ethical reasoning by obscuring the ways in which accounting decisions must be thought through in practice. Accountants with particular ethical perspectives more readily understand and construct particular types of knowledge, so the two issues of knowledge and of ethics are inseparable. Increasingly technical accounting rules can therefore counterproductive. Instead, our best approach to avoiding future scandals is to redefine and reinvigorate professional ethics in the financial world.